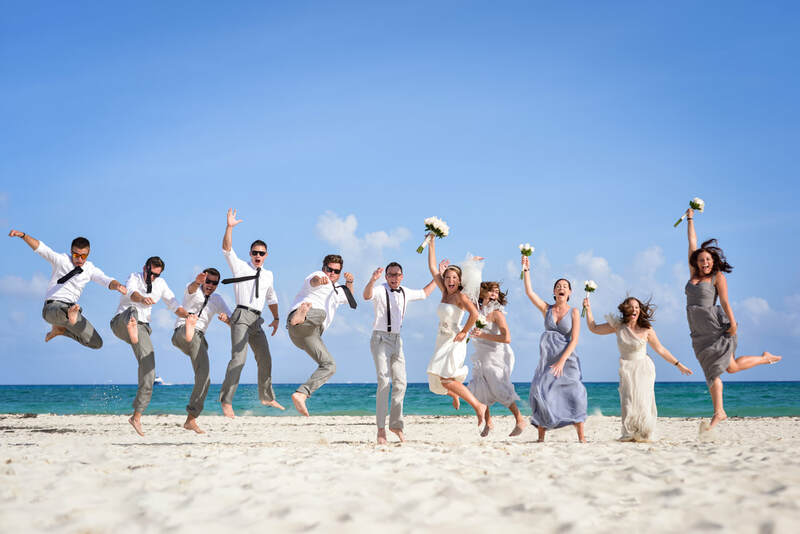 Beach destination weddings are our specialty! Destination Weddings are . . .
Easy! Let us handle the work. You just make a few decisions, and show up to your wedding while we take care of everything for you. Memorable! Your family and friends will never forget your wedding day and will thank you for inviting them to such an incredible event. Cost-effective! Many resorts have free wedding packages and all-inclusive resorts often include a dinner reception for you and your guests at no extra charge. And remember, our services are complimentary! ​Mexico or Caribbean just got easier! Why Choose Romance Travel Group? We have planned hundreds of destination weddings, honeymoons and vacations for couples from across the United States. We are recognized by our peers and colleagues as travel industry leaders. We have been named “Top Agency” and "Best Travel Agent" by many major hotel chains, travel and wedding companies year after year. We are on location at the resorts we recommend several times each year, ensuring our clients the best experience possible. We personalize our service to each couple. We are not a wedding factory. Every wedding couple we work with receives a free, personalized website and custom domain name. Our travel partners offer 24/7 traveler assistance in the event that we cannot be reached. We offer value added amenities such a room upgrades, spa treatments, resort credits, or room discounts at many of our destination wedding preferred resorts. We offer payment plans to assist you and wedding guests with travel expense budgeting. We can price match nearly any online price. Our services are complimentary. We greatly appreciate your referrals. Wow, I don’t even know where to begin. After we got engaged, we started looking around for wedding venues and were floored by how expensive everything was. We wanted something different than the old boring chicken dinner wedding reception. One of our friends mentioned a destination wedding to us, but we thought for sure something like that would be even more expensive than a wedding at home. Our friend had attended a wedding that Romance Travel Group planned last year and just raved about it. We decided to give them a call to just check it out since it sounded too good to be true. After our first call, we were so excited but still in a bit of disbelief that this could actually work. The next day, we received a list of wedding resorts that our agent matched us up with. I don’t even know why I spent all that time online looking things up on my own, because it was a waste. Our agent nailed it! She took everything we told her during our call and picked out the best resorts in our budget that matched what we had in mind. Our wedding was perfect. Everyone loved the resort. We got to spend 4-5 days with our guests. We ended up taking everyone on a catamaran cruise to celebrate and had a ton of fun. Many of our guests are already talking about going back. Having a destination wedding was the best decision we could have made. We loved it. Our guests loved it. Romance Travel Group made it happen and we will be forever grateful for their guidance and advice. Don’t get dragged down by the pressure to do a traditional wedding! If we did it, so can you.